September 18, 2015–January 10, 2016 – extended through February 21, 2016. How do works of art endure over time in the face of aging materials and changing interpretations of their meaning? How do decay, technological obsolescence, and the blending of old and new media affect what an artwork is and can become? And how can changeable artworks encourage us to rethink our assumptions of a work of art as fixed and static? 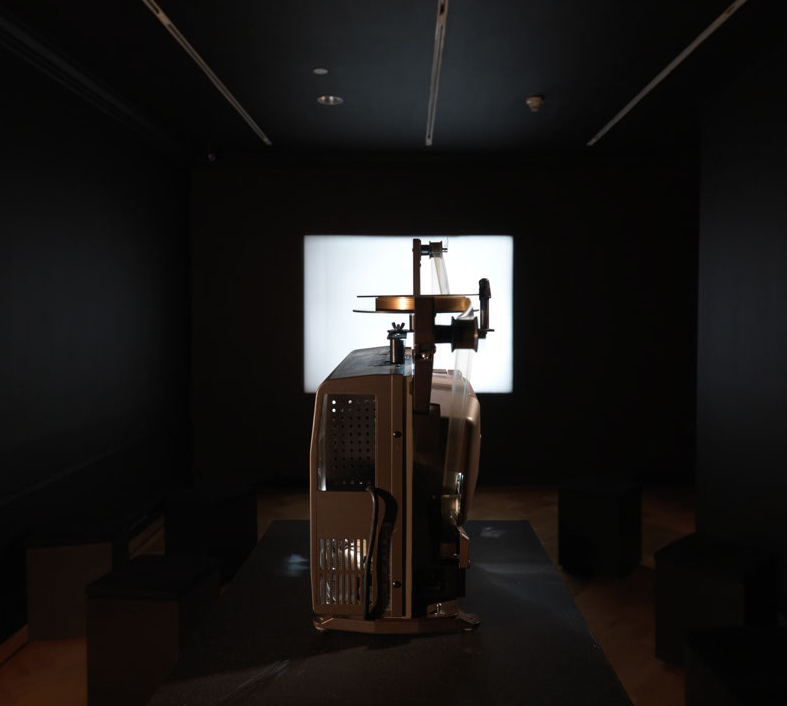 Revisions—Zen for Film, on view this fall and winter in the Bard Graduate Center Focus Gallery, explores these questions through Zen for Film, one of the most evocative artworks by the Korean-American artist Nam June Paik (1932- 2006). Created during the early 1960s, Zen for Film consists of the screening of blank film leader for several minutes. As the film ages and wears in the projector, the viewer is confronted with a constantly evolving work. Revisions—Zen for Film provides a fresh perspective on an artwork with a rich history of display by asking precisely what, how, and when is Zen for Film? The digital interactive with contributions by BGC master’s students (co-developed by Linked by Air) frames Zen for Film through conceptual associations that correspond to viewers’ experiences of it—boredom, chance, materiality, nothingness, silence, time, and trace. Through these concepts, Zen for Film is linked with a number of artworks that can be viewed as potential inspirations, antecedents, or contemporaries. Together these suggest issues of appropriation and continual reinterpretation. Included in the digital interactive are artworks by Cory Arcangel, John Baldessari, Robert Barry, Joseph Beuys, George Brecht, John Cage, Com&Com, Tony Conrad, Merce Cunningham, Guy Debord, Marcel Duchamp, Ceal Floyer, Ken Friedman, JODI, Yves Klein, Imi Knoebel, Joseph Kosuth, Christine Kozlov, Peter Kubelka, Kazimir Malevich, Christian Marclay, Robert Rauschenberg, Man Ray, Robert Ryman, Paul Sharits, Hiroshi Sugimoto, Mungo Thompson, Michel Verjux, Andy Warhol, and Lawrence Weiner. Visit bgc.bard.edu/revisions for more information on the exhibition and accompanying publication, to access the interactive, and to find out about related public programs, group tours, and the symposium, Revisions: Object—Event—Performance—Process since the 1960s (September 21, 11:15am-6pm).